My mother, Harriet Catherine Bohen Bert, would be amazed and probably a little embarrassed to find her memories being read by such a large audience! I seriously believe that she wrote this record for herself more than for others. It was her way of processing her life. In the late 1980s and early 1990s, she and my dad seemed to go through a period of “putting things in order.” This lead to things like Dad’s copious inventory of the items they had acquired on their later-in-life travels, the self-publishing of his own life story, Walk Memory’s Lane, and this, Mom’s modest journal which was tucked away in a green three-ring binder. Unlike the little volume, which we in the family referred to as “Dad’s Book” and which he happily passed out to anyone who showed the slightest interest, I don’t remember Mom ever suggesting that anyone beyond the immediate family read her three-ring binder. I had not read this journal in its entirety for probably 20 years. But in Mom’s last years at Messiah Village when topics of conversation became increasingly difficult, I would sometimes pick up the green binder and read a paragraph from her childhood pages just to spark her memory. We’d laugh about how much she hated canning fruit and vegetables, and how she still hated the very thought of oatmeal—she had eaten enough oatmeal in her childhood to last a lifetime! And we’d talk about the realities of life during the depression of the 1930s and World War II. I am thankful to have been given this reason to re-read Mom’s humble record and to realize anew how the experiences in her early life affected the home she created. We are pleased to share Mom’s journal with this readership, and I’m trusting she’ll eventually forgive me for being a part of it! She usually did. My life began October 21, 1917 in the tiny town of Hope, in Dickinson County, Kansas. 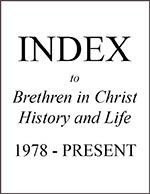 I was the fourth child of Walter E. and Martha M. (Book) Bohen, who were both 29 years old at the time of my arrival. I had two older sisters, Gladys and Elizabeth, and a brother, Evan, just a year and a half older than me. Later two more sisters arr­ived, Naomi and Mary. I understand that my father considered naming me “Frieda.” How glad I am that he didn’t! As a child, I remember two kindly nicknames, Topsy and Bright Eyes. My Aunt Mary started calling me Topsy during a game we were playing. I liked it because it was a gleeful name and Aunt Mary chose it especially for me. Later, at about age 7, I remember my Aunt Jane calling me Bright Eyes because she liked the way my black eyes sparkled. This name was also most welcome because it was a term of endearment. As I grew up, I forbade anyone from abbreviating my given name of Harriet to anything shorter—no nicknames! Memories of my early years in Kansas are dim. My father was a carpenter, but we often rented a house on a farm in the country which was worked by someone other than my father. My father never owned a house until four of his children were married and in homes of their own. Most of our houses were very old and in need of a lot of repairs but my parents made homes of them. I remember best the few years we lived in the community of Moonlight, Kansas. As I recall, our Moonlight house was a white, wooden two-story with a big yard and huge trees full of singing summer locusts. Moonlight was home to a one-room schoolhouse, and the Bethel Brethren in Christ church was nearby, but I don’t recall any stores. Though store-bought toys were scarce, we children had many happy times. We were resourceful in our play and often found secret hiding spots under lilac bushes or around our various houses and barns. When we lived in Kansas, our neighbors were farmers with a house full of boys and we had lots of good country fun between our two homes. When their bull would let out a tremendous roar from the pasture, I remember streaking for the safety of home as fast as my feet would go! 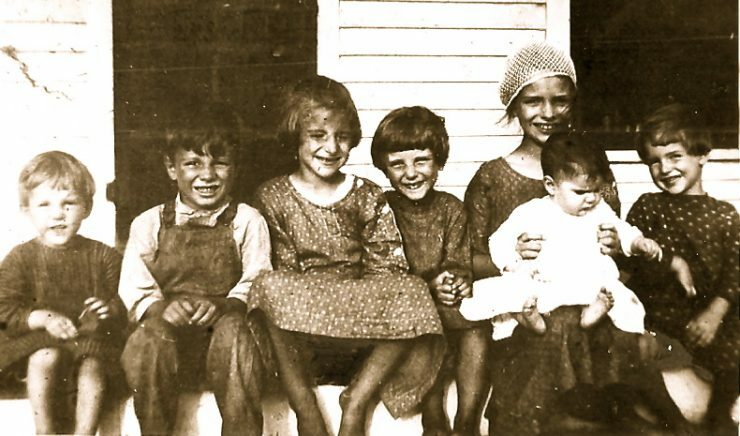 The Bohen family and friends in Kansas, circa 1921. Harriet is on the right beside her oldest sister, Gladys. Our barn had a huge track-mounted door that could be pushed back and forth. We were often warned not to play with it, for it could easily jump the track and fall. One afternoon the neighbor boys visited and, for want of anything better to do, were moving the door to see how fast it would open and close. I was standing nearby with my baby sister, Mary, who was about two years old, enjoying all the fun. Suddenly the door came off the track. I must have run out of its way, but Mary was caught. The heavy door fell on her and she was thrown backward into an old tire. When the door was removed, we found that her leg was broken and she had a deep indentation above her eye where the door had knocked her head into the center of the tire. We feared she would not live. I was dispatched to the small school to get my two older sisters. We called the doctor and waited eagerly for his verdict. Mary recovered fully, but a mark remained above her eye. Looking back, the center hole of the tire had saved her from being crushed. Of course, my parents asked how it all happened and we told them, but with an added dimension from me. Although I was only about five years old, I fully remember telling them that I had instructed the others “not to play with the door.” In reality I hadn’t opened my mouth at all—it was such fun to watch! This deceit bothered me for many, many years; I knew I had lied. I eventually told my parents the truth, and only then did I feel relieved of my guilt. Our family never had much money, but we had good times as children. Christmas was certainly not as we know it now. My mother made some small things for us, so we did have some gifts. One year I could carry all my gifts in my two hands, which I did. And to my horror, I dropped the small porcelain doll which was my pride and joy. Of course, it broke, as did my heart. It could not be fixed and was not replaced. Before I move too far into my life’s story, I should share some more descriptions of my family members. My father was generally kind and worked hard at any job he had. He loved to read and spent a lot of time in Bible study. In mid-life, after we moved to California, he felt an urge to preach and be involved in church work. Today we’d call it “church planting.” He was involved in the beginnings of the church at Chino. For a few years he held a Sunday school on Sunday afternoons in North Pomona, about six miles from our home in Upland. Then for a couple of years he was involved in a small church being formed in Norco, about 30 miles southeast of our home. Papa was a deep thinker and very conscientious but he also had a broad mind. In my pre-marriage years he gave me sound advice which would have run counter to church directives but I’ve always appreciated that. He laughed easily and was a real romantic at heart although I’m sure the hardships of raising a large family during depression years took their toll. Though he loved his children, he was very stern and sometimes his discipline was very harsh. In the mid 1930s he became a contractor/builder and formed a partnership with Alvin Gish, a fellow Brethren in Christ build­er. He built the only home he ever owned during this period in his life. Looking back, I wish I had spent more time with him as I’m certain I carry some of his traits. As I think of my mother, I remember a woman whose days were filled with work and not much to relieve the grind. My mother was often unwell, maybe due to the arrival of six child­ren spaced just one to two years apart. During one of her periods of illness, Naomi and I were sent to stay with an “Uncle Ben and Aunt Annie.” I learned later that their surname was Bert. I have been told that Mother had contracted tuber­culosis and was in isolation at home. She didn’t expect to get well, as she later told me, but our church believed in divine healing. The elders of the church came, prayed for, and anointed Mother, and she recovered. She says she had no faith for healing but others believed in God’s healing for her. The tuberculosis never returned and none of her children ever had any symptoms of the dread disease. Mother was a wonderful seamstress. She had to be, with five girls to keep in dresses and underclothes, all of which she made, and a son and husband whose shirts, underthings, and nightshirts were also handmade. She always prepared good and satisfying meals although she rarely had a big food budget. She was a wonderful pie baker and our family often ate one or more pies at a meal. Cakes were mixed by hand for she had no mixer and no ready-mixes. I think she managed the money for the family, at least to a large degree. She was gifted at stretching a dollar, and she could also stretch a pound of hamburger or a can of ten-cent salmon to feed our family well. Large boxes of Quaker Oats were about 15 cents and provided our daily breakfasts. A loaf of bread was about 15 cents and a bunch of carrots about three cents. While food in those days didn’t cost much, Mother guarded every penny. On the other hand, my father was an easy touch. If I wanted a nickel I went to Papa because I knew Mother would certainly say no! Mother’s meals were not always elegant, but she filled our hungry stomachs. I recall Mother’s great black skillet, which she often filled with thin-sliced potatoes and onions. I loved that simple fried vegetable dish and still do today. She did her best to delegate chores to each of us as we grew old enough to do them. Weekly dust­ing and cleaning was almost always done. We didn’t have a vacuum cleaner, but dust mops and brooms and dust cloths were used. With a house full of children, I’m sure there was a lot of clutter, but I never remember that Mother was slovenly about any of her housekeeping. I think Mother really never had much of a childhood of her own. Her own mother died when she was in her early teens. She had three younger brothers and her baby sister was about a year old. She kept house for her father and her siblings until she was married at age 22. In California, she cleaned for other people, and then she took in washing and ironing to augment our family budget. Every morning she faithfully packed seven lunches. I can imagine she enjoyed her own lunch alone, though on occasion if I happened to come home at noon, I would find her on a stool by the kitchen counter eating some leftover cold oatmeal from breakfast. Not appealing to me but she said she liked it. To this day, I can still almost taste the goodness of one of her homemade sandwich fillings—grated cheese mixed with salad dressing. Much more could be said about both my parents. They quarreled, yes, but never once was I fearful that they would not eventually resolve their differences. We always had family worship around the table after breakfast. This involved reading a portion of the Bible and prayer, which we did on our knees. It is a practice Eldon and I continued in our home. I’m convinced that if more families would follow that practice there would be fewer family breakups and divorces. My parents moved to Pennsylvania in the mid 1940s. Papa died at the age of 63 of a heart attack. Mother lived to be 93 when she just seemed to fade away. They were good parents who did their best to teach all of their children to always live clean, productive lives, accept Jesus as Savior, and always live by Christian principles. The Walter and Martha Bohen family. Back row from left to right: Harriet, Elizabeth, Mary, Gladys, Naomi. Evan is seated next to his father in the front row. My oldest sister Gladys was six years older than me. Being an older sister to five younger siblings probably contributed to what I observed as seriousness and a great sense of re­sponsibility. In my teen years, and for much of my life, I dubbed her “the angel child.” I never meant it to be an unkind nickname but she never seemed to do anything wrong. She was very sensitive, always aware of the needs of others. She was the only one of us children who finished college. She taught English and Latin for a couple of years at Beulah College and later served with her husband as a missionary to Africa. I don’t remember interacting too much with Gladys, especially in my younger years. Sister Elizabeth was also older than me but very unlike Gladys. Elizabeth was not passive, and she possessed a strong mind, one which was not easily changed. She rebelled at some of the things expected of her. While Gladys was more of a scholar, Elizabeth excelled in the more practical aspects of learning, like math and bookkeeping. She became an excellent seamstress and a marvelous cook. She was a perfectionist. After her early days of high school she settled down and became a dedicated individual. She was a real friend to me and taught me many things. Evan was my only brother, just a year older than me, and I always felt a special affinity for him. I felt hurt when he was punished, and that seemed to be too often. I was terrified that he’d run away from home. When we were very young he and I got into some devilment which resulted in the worst whipping I can remember ever receiving from my mother. We deserved it. He supported me in some of the disappointing things in my teen years and I know he was concerned about my spiritual welfare. He graduated from Beulah Academy, as did all of the Bohen children. He became a good carpenter, and eventually an excellent build­ing inspector for big contractors. I could not have chosen a better brother. Naomi was immediately younger than me. I remember her as strong and stubborn. Like Elizabeth, she had a mind of her own and clung to her own opinion against all odds. I vividly remember one time that she refused to eat something Mother had for dinner. Papa was determined she would eat it and Naomi was determined she would not. A battle ensued and while I don’t re­member exactly who won, I’m inclined to think Naomi did. She hated worms, and Evan loved to taunt her with them. She could get her way with making Mary or me do or not do something. She later told me her secret: “I would get hold of both thumbs and hang on until you agreed to my way.” If you ever have tried to function with both thumbs held captive, you can imagine our helplessness. Naomi had beautiful teeth and a lovely complexion, and in her early teens she spent, what seemed to me, too much time in the bathroom grooming herself. She has made a won­derful farmer’s wife and was a refreshing companion to me. My baby sister Mary is three years my junior. Early memories of her are vague, although I’ve already recounted the barn door incident. Mary, Naomi, and I frequently shared one bed in our full household. When she was quite small, Mary had dark curls and the few pictures I have show a cute little girl. In her teen years she developed many talents. She took piano lessons which she paid for herself. For a while, she worked in a photography shop and she was the only one of us girls who didn’t work as a house maid to earn money. Mary had a ready sense of humor but was deeply spiritual as well. She was the only one of the Bohen children who moved with our parents from California to Pennsylvania. In fall 1923, the Bohen family left Kansas for California. My father’s desire was to move nearer one of our church schools, either in Pennsylvania or California. My mother needed a better climate for her health so we chose the warmth of California. Mother was not well enough to travel by car so she and the youngest three girls went by train. I remember getting raisins as treats for the journey and coloring books to occupy our time. An older couple joined us to help Mother care for us girls. My father, with Gladys, 11, Elizabeth 9, and Evan 7, drove a Model T Ford from Kansas to Colorado for a short visit with my uncle, and then through the deserts to Upland, California. Their experiences, as I have been told, could be another chapter, but since I was not part of the group, I will leave that to their telling. The car travelers left Kansas before the train travelers, but we all arrived around the same time. The car travelers arrived at the Upland Brethren in Christ Church on Thanksgiving Day. From what I have been told, the children, es­pecially Evan, were sadly in need of a mother’s care. Of course, we had no reservations at any place to stay so the C.C. Burkholder household took us in. Brother Burkholder was a bi-vocational carpenter/builder, pastor, and leader of the church, and his family was regarded for their hospitality. We eventually moved to a house in an orange grove on San Antonio Avenue and 7th Street in Upland. My memories of this house are gone, but I do remember our next home on 11th Street in Upland. It was also in an orange grove. I recall strolling through the grove with my father. He would find a crate full of oranges and then peel one for me to enjoy. I can still see how carefully he peeled that orange without breaking any of the inner membrane. I think of this almost every time I peel an orange. At one time we had goats which we milked for our use. Goat milk was very healthy for all of us, but I haven’t had it since those days. It was from this house that I went to the Fannie D. Noe Elementary School in Upland to begin my education. Since her illness in Kansas my mother was not strong. When another type of illness put her to bed, we “three little girls” (as I and my sisters Naomi and Mary were called) were sent to live with kind people of the church. Naomi went to the Roy Franklin home, neighbors on 11th Street near our home, and Mary and I went to the Swartzendruber home on 21st Street. These stays were not too long, as I remember. Around the time I was in second grade, we moved into a house in town, on 2nd Avenue just a few blocks north of the main part of Upland. I remember being so excited to be able to play on concrete sidewalks instead of dirt yards. Summer evenings were wonderful when we could return outside after supper to play until dark. It became a game to see who could first say, “Street lights are on!” Seems silly now, but it was part of our fun. In a couple of years we moved again to a slightly larger house on 3rd Avenue, still near downtown Upland. This house was directly across the street from our church, which also was the home of Beulah College, our church school. We had a sense of permanency here for a number of years., and the church school was woven into the warp and woof of my life. We interacted in many ways with the students, even joining sometimes in their physical ed­ucation classes. My father surely must have felt that his early resolve to move his family near our church school was justified. Over time, all of these houses we lived in were razed in the interest of development. 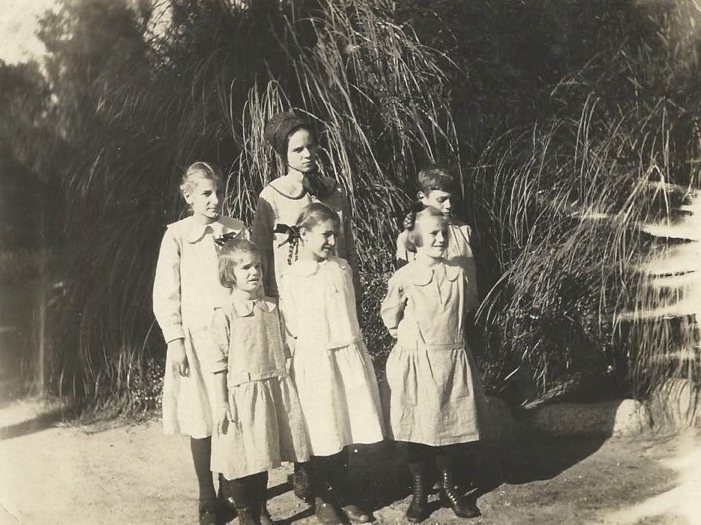 The six Bohen children on an outing in California. 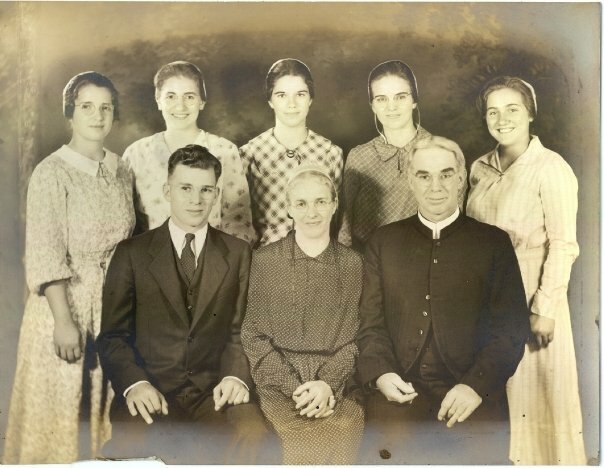 Back row, left to right: Elizabeth, Gladys, Evan; front row, left to right: Mary, Harriet, Naomi. During the latter years of the 1920s and the early ones of the 1930s, our family, like so many others, felt the Great Depression keenly. My father was often without work. To feed, clothe, and pay rent to care for a family of eight took its toll in worry and hardship for both my parents. During these very lean years, my father had to borrow money from kind church folk to meet the bare necessities of his family. Some years later I remember my relief when the last payment of those debts was made. Also during the Depression my mother began to do cleaning for other families. Sometimes I would go with her to be an extra set of hands. Mother was not strong physically, but somehow she managed this extra work while not neglecting her role as cook, seamstress, nurse, busi­ness manager, etc. at home. I have never understood how she managed on so little. She could put a meal on the table which was satisfying, though surely not elegant. Our clothes were almost always mended and she made our bed linens. Hand-me-downs and make­overs were very common, though seldom in the latest fashion. Mother also modeled hospitality. Almost every Sunday we had beef pot roast for dinner with the fluffiest of mashed potatoes and smooth brown gravy with no lumps. Very often we would invite someone from among our childhood friends to share our Sunday dinner. One time Papa brought home a homeless person whom we called “Peg-Leg” because he had only one leg. I often wondered how Mother managed to put a satisfying meal on our table with so little money to buy what might be at the market. Most of the milk we had in our home was provided on a barter system. The Alderfer family had a dairy on the east edge of Upland. Mother went to their home about once a week to help Mrs. Alderfer with mending or sewing for her family. In return, for at least a part of her work, we were given milk—sometimes in large quantities if there was a surplus at the dairy. Often Mother used a good portion of this to make cup cheese, a soft, spreadable, pungent cheese. Mrs. Alderfer would be given half of the finished product. Sometimes one or more of us children would go with her for the day to play with the Alderfer children. With her full, busy, and tiring days, Mother always seemed tired and care-worn. Prone to headaches, she often rested in the rocking chair at the end of the day and we girls would brush and comb her hair. This seemed to be restful to her, and it was a pleasure for us to arrange it in different styles. All of her five girls had long hair, combed and braided every morning (well, almost every morning). No doubt, by the time Naomi, Mary, and I had to have it done, Gladys and Elizabeth were doing their own. It must have been a time-consuming morning task before sending us off to school. As I grew older I hated those pigtails and I was tempted to chop them off. I knew that if I cut my hair, I’d get a whipping, but the idea of short hair was appealing. I never did it though. We Bohen children had a lot of friends and we played with real zest. After moving to 3rd Avenue, we played with many neighborhood children using the street as our primary playground. Some of these playmates were church friends, for many Brethren in Christ families lived nearby, but some were neighbors unconnected with the church. I especially liked my girl friends at school and I got on well with all of them. I often wondered why my good school friends never invited me to parties in their homes. I suspect it was because we were Brethren in Christ and somewhat restricted in what we were allowed to do. It hurt, but it didn’t stop my friendship with my schoolmates. My best friend was Ruth Eckman, whose brother Chester later married my sister Elizabeth. We entered school together and remained bosom pals all the way through high school. Ruth’s family were orange growers and lived a mile or so away on the east edge of Upland. We would often go home with each other after a Sunday morning church service and spend the whole day together. Many years after we were both married, Ruth told me she always loved to come to our house because our family always seemed to have so much fun and laughter around the table. I treasured her insight. I loved going to her house to play with all her dolls and the things needed to play house. Irene Musser Engle was another close friend. But it was Ruth and I who spent hours with her dolls. I always loved to play house and found it fun to set up and organize the house. There were times at school when my friends and I would mark out a house with small stones outlining the rooms. We could spend a whole recess or lunch hour building and organizing our houses. As I grew, I learned to love more physical games like softball. I wasn’t a fast runner but I could hit a ball. I liked school because it broadened my knowledge of another world as I interacted with people other than my family. Every year though, we had a health class, which I sorely disliked because it seemed like the same things were repeated each year. Health class also caused me to become more conscious about my teeth. At home we were never taught or encouraged in tooth-brushing—at least during my early years. But at school we were given a tooth brush and tooth paste. I wasn’t always faithful, at that age, to do it each day, but it was definitely a beginning. A couple of other incidents along the way in these very early school years served to bolster my self-image. During the dreaded health class, the teacher stressed the importance of good posture. On one occasion, I stood before the class as the teacher pointed out my straight back. Although it felt a bit strange, I was pleased to be singled out for something positive. Another time, during music class, I was again singled out for using my voice box in the proper way. The teacher reached around my neck to my throat as I stood beside her and demonstrated the feel of the voice box. Again, it seemed really strange to me, but gratifying. Read­ing was one subject that was greatly stressed, and I loved to read. We often played a game where one student would stand and read a portion of a story for as long as he or she made no error in reading. When my turn came I could read for a long time without any error at all. The game was fun and it boosted my self-esteem as well. My parents seldom gave me compliments, so my school community really encouraged me to pursue small talents. As Brethren in Christ, I believe my parents tried to avoid the sin of pride so they didn’t heap praise on their children. As I advanced into other grades some of my abilities were noticed and encouraged by my teachers. Around sixth grade, I began performing in school plays. My first roles were mostly as a comic or as a villain. It seemed I could do either quite well and I loved the stage. In junior high I was given a lead role in an operetta. I loved to sing and had sung in church and children’s meetings at church as long as I could remember. My voice was strong and carried well. Miss Colton, the music teacher, took me under her wing as a sort of protege. Her influence helped me appreciate my talent for singing. She urged me to continue studying voice and music to prepare myself for a career in that field. Of course, I knew that a music and drama career was out of the question, but I continued to enjoy singing throughout my life and was able to use my talent in various ways. I studied some voice and other music-related subjects when I went on to Beulah Academy for high school. My parents never forbade my roles in school plays as long as the role didn’t include dancing. They didn’t oppose my play-acting, but they didn’t encourage it either. Their faith convictions did not allow dancing. I remember carrying a note to gym class asking that I be excused from dancing when that was the planned activity. This disappointed me because I loved rhythm and movement to music. They never came to any of my performances, but I didn’t resent their attitude; I just accepted it. As the economic depression of the early 1930s lessened, our family’s ability to cope improved. My father got a steady carpenter job, though it took him away from home all during the week. The uptick in family income allowed me to have an allowance of five cents a week, and my parents bought a piano. My mother showed me middle C and its relation to the note in the hymnal. She had no formal training but somehow conveyed to me the function of the black and white keys. From that I learned to play hymns. My self-teaching was all the piano lessons I ever had but I learned to play reason­ably in most keys. I even learned to transpose sharp keys, which were always difficult, to corresponding flat keys. Three or four of us girls learned to play the piano in this way. And similarly I learned the typewriter key­board. My father bought a typewriter with an instruction booklet and I worked at that until I had mastered it quite well. In high school I took a year of typing to master additional typing techniques. I must have done all right because a young neighbor woman paid me to type her thesis for some sort of degree. While we were still living on 3rd Avenue, I began to earn a little money by going to the Thomas Franklin house to wash dishes. (Thomas was the maternal grandfather of Eldon Bert who later became my husband.) Grandma Franklin gave me 15 cents an hour for helping her and I was allowed to keep for myself all that I earned. I also worked some summers as a mother’s helper. One summer I lived in the Charles Hershey home where I had my own room, a real luxury. Mrs. Hershey was not well and the family needed help caring for their four children and doing other household tasks. One summer I was a helper in the Reuben Hershey (parents to Charles Hershey) Nursing Home. They cared for elderly persons, and my duties were cleaning and general assistance. Of course I didn’t live in the nursing home, but I went every day or as they needed me. I never liked that job. I don’t remember taking family vacations the way people do today. Instead, we enjoyed day trips with other families, often to the beach. On one outing, my father had taken my mother into the water to jump the waves. He ventured further out than was wise and Mother lost her footing. Neither one could swim and I can still see my mother so terribly frightened and struggling for footing. I don’t think she ever ventured into the water again. There were trips to the mount­ains too, also in company with other families. We spent evenings in parks where we could have picnic suppers. In the fall, we drove to apple country for a good supply of apples. It was another fun family excursion for the family that usually lasted all day. We picked the apples or bought a quantity at a reduced rate. As a teen, I remember one orchard outing particularly well. Our car was an open style touring car and in the evening we fastened the side curtains to keep out the cold. The apples were stored on the running board since there was no trunk and the inside was full of family. I was sleeping in the back seat but was jolted fully awake when the car was side-swiped by another vehicle. Our apples scattered everywhere. The driver of the offending car drove away, but we knew he was drunk. No one was hurt in our car, but we were shaken up and we lost our apples. Another near accident happened on a Sunday during those very early California years. Mother’s brother Cyrus Book had moved to Whittier and we drove there once or twice a year to visit him and his family. The narrow, hilly road to their home took us through Southern California’s oil well district. One time on our way home we were descending one of those hills and my father sensed he needed to brake. To his horror he discovered he had no brakes. In a panic he threw the gears immediately into reverse. I don’t know how he did it, nor do I know what damage it did to the gears, but we did stop! As I grew old enough to help around the house, one thing I hated about the summers was the seemingly never-ending task of fruit-canning. Peaches, apricots, cherries, pears, and apples grew in abundance not far from our home. We could buy quantities quite reasonably and were given some. Mother had a supply of big two-quart jars, and they were almost all full by summer’s end. There seemed to be hundreds of them! The job for me and my sisters was to prepare the fruit for canning. Although it was a tiresome chore, the fruit did taste awfully good in the winter months when fresh fruit was not in season. Another duty I detested was dishwashing. There were five of us girls and we all took turns at dishwashing and drying. The dishes were often chipped because so many of us handled the dishes with not too much care. There was a prescribed order to the process: glasses, silverware, china, and finally, pots and pans. The pots and pans were so big and hard to get clean. Drying dishes was preferred to washing, and clearing the table was best of all. But all of it interfered with play, reading, or other preferred activities. I hated that dishwashing job since we sometimes used homemade lye soap and homemade dish rags. Our church was truly the center of our social and religious activities. We never questioned that we’d be in Sunday school and church on Sunday morning and in Junior Meeting, or Young Peoples meeting, and Sunday evening service. In addition to Wednesday night services, we attended all the revival meetings and tent meetings too. Many of the local churches had Vacation Bible School for children but our church never hosted it and we were never allowed to attend VBS elsewhere. I got the feeling that we couldn’t go because our parents wanted to avoid any possibility that we might want to attend that church. After Eldon and I were married our church had dropped that fear and I helped in one such Bible school during a summer. We were fully involved in our local church. I enjoyed the Junior Meetings held for children up to about upper junior high or high school. I especially enjoyed the singing because I had a strong voice. I was asked to be the song leader and I enjoyed that. Later, when an older group was formed to sing in the services, I led that group also. I had very little training, but loved vocal music and apparently took to it naturally. For several years in my early teens my father was engaged in helping to establish Sunday schools in a number of different areas. Before there was a Brethren in Christ church in Chino, my father and Jesse Eyster, another minister, would go to Chino on Sunday afternoons to hold a Sunday school. Papa took me with him, maybe for the singing, or maybe to keep me out of mischief at home. But in other places, like North Pomona, and at Norco I went with him to help with the singing. At Norco a church was begun with Papa as pastor and for a number of years I went with him to help with the singing. I even played the piano to accompany the singing. In my upper teen years I sometimes joined tent workers as we were called for gospel work in the summer months. One year we were in the San Joaquin Valley. I taught Bible school during the day and was a part of a ladies trio that provided the special music during the evening service. Another summer we were in the Sunnymead/Moreno area for the same reason and with the same responsibilities. I never was obsessed with boys in my early years and into my early teens. I liked them, but never singled one out—except for once! He was in my class at school and was kind, courteous, blond, and friendly. He was a son of a military family and was not Brethren in Christ. Even at that early age I knew I would never “go with” anyone other than a Brethren in Christ boy. But I did like Robert Taylor. In fact, one day I ran away from home to go to the Taylors. On the way I fell and scratched my bare knee badly. Small rocks were embedded in the skin and I still carry the scars of that outing. (Robert Taylor was one of the first local casualties I heard about in World War II. He was a flier and lost his life in this way. I was sad for I remembered those days so long before.) I had too much fun being a girl, doing girl things, laughing and having fun with my girl friends to bother about boys. Today a girl has a steady boyfriend before she even reaches her teens. I was still interested in dolls at that age and I loved to read. Often I would shirk some task my mother gave me to sneak off to read! Then, when found out, I’d hurry to get the job done. Boys, at least any particu­lar ones, didn’t enter my thinking until I entered Beulah Academy. Sometimes I daydreamed about boy and girl relationships, probably as a result of avid reading and a vivid imagination. But I never really imagined having an actual date! So you can imagine my surprise when Eldon Bert appeared at the Dr. Ryan door one afternoon when I was working to ask me for a date. I didn’t realize that any boy, least of all Eldon, even knew I was around. I was a sophomore and he was a handsome junior with heavy, curly, dark hair, and heavy curled eye lashes over light colored eyes. He was muscular, loved sports, and very popular at school. He completely swept me off my feet and my heart was lost at once. That was in the spring of 1934 and I never looked amorously at another boy from then on. We dated until our marriage in December 1939. Our dates were few and far between during those first years, maybe once a month or so. We did see each other almost every day at school and just a wink from him would make my day. After our graduations from high school our dating became more frequent but almost never more than once a week. Another chapter in my life opened upon my graduation from Beulah Academy in 1936. I needed work to pay off my school debt. I had a strong feeling that Eldon and I would marry, so I had no real urge to pursue a college education. Furthermore, I had no money for it and didn’t want to incur further debt. If situations had been different, I would have chosen a music career, but there was not much chance of making a career in the kind of music I preferred. So I chose to try to prepare to become a good wife and hopefully a good mother. Although I have been content with that choice, I often wish I could have studied more music. After a year at home, I took a job as a live-in maid in the Brad Whitney home. [“Plain girls” like Harriet and her sisters were often sought after as housekeepers because of their housekeeping reputations.] Mr. Whitney was a wealthy citrus grower in North Upland. They had two sons, both in boarding schools. I had no cooking experience to speak of and I certainly knew nothing about how to serve a formal dinner, but I learned. I remember calling Elizabeth, who was working in another home in Upland, to get some advice on how to cook peas. I had a Boston Cooking School cookbook and referenced it often. I well remember the Thanksgiving dinner I was expected to cook and serve. I had never seen a turkey without its feathers before. The bird was delivered without feathers, but the rest of its preparation was up to me. Petrified, I called Mother, and even though I’m sure she had her own Thanksgiving preparations, Papa drove her to the house and she showed me how to clean it, make the dressing, and stuff it. Of course, all the other food had to be cooked and served on time too. I don’t remember how I got through it all, but evidently it was okay, for I wasn’t fired. I could write a whole chapter on experiences at the Whitneys. I certainly earned and needed the $40.00 a month pay check for those nine months, but didn’t exactly enjoy the work. I cooked, served, cleaned, even turned down beds, and laid out pajamas and slippers for those big sons –one older than me. On occasion, I had to “babysit” the two dogs. I left the Whitneys and lived at home for a second school year while I took some music courses at Beulah College. During the next couple of years I earned some money working in three other homes, including the Burns home in West Covina. They had three children, some of whom needed my supervision. This home was quite ordinary, not at all like the Whitneys. My status was more as a helper to Mrs. Burns, but I continued to learn methods of housekeeping, child care, and the like. One summer I joined the family at their summer home in Laguna Beach. Eldon came to be with me on one of my free after­noons and we spent time together on the beach. I could not swim, but went with Eldon into the surf to jump the waves. A strong one came and I lost Eldon’s hand and went under. It terrified me as I didn’t know if I was going out to sea or being washed toward shore. Of course, the water receded and I walked back to the beach. Another home where I worked for a brief period was the Allard home in the Ganesha Hills of Pomona. Mr. Allard was an attorney and their lifestyle was more formal than the Burns but not as formal as the Whitneys. They also had three children—an older son, an adopted pre-teen daughter, and a young son. It was the most difficult place I ever worked. My oldest sister, Gladys, had worked there during the birth of the youngest son and she got along well and loved it. But my experience was different. I had to get up at 5:00 every morning to finish all the dusting and rug cleaning before the family aroused. I attempted to do all of this without making any noise, as I was instructed, but running a carpet sweeper over rugs does create some noise. Mrs. Allard would pop out of her upstairs bedroom and scold me for mak­ing noise. Then I had to ready their breakfast. The evening meal was another trial. Mr. Allard would arrive home about the time I had the meal ready and decide to shower before dinner. I found it challenging to keep the meal warm and appetizing. Most days I worked hard from the early morning alarm until 9:00 p.m. or after when the dinner dishes were finally put away. I was constantly tired and was more than happy to leave after about a month or so. In 1938 I went to work in the Lawson home in North Upland. Compared to any other home I worked in, this one was surely the best. The family was Scotch and consisted of a grandmother, parents, and two pre-teen children, a girl and a boy. Mrs. Lawson often helped on cleaning day. From her I learned better methods of cleaning which I used throughout my life. I also learned how to reduce after-dinner clean-up. If she used a utensil to make something she always washed it, dried it, and put it away immediately. The children attended local public schools, but did not ride the buses. On several occasions I was given the “wee car,” as they called it, and asked to fetch them from school. I enjoyed this errand and their confidence in me. I think during my time in the Lawson home I made my first apple pie—the first of what would be many apple pies. In all of these homes I ate my meals in the kitchen, either during or after the family had been served. I call these years of domestic service “my college education.” Certainly, the work helped to prepare me for managing our home. I learned how to organize my work so that I would get it all done, including a schedule of certain jobs for certain days. I learned how to set a beautiful table and how to entertain guests at dinner. I learned that an uncluttered and clean house is a restful haven. I’m thankful for those years of training. In the fall of 1937, Eldon proposed. I was waiting for this and I’m sure Eldon had no doubt that my answer would be a ready “yes!” However, it would be one and half years before we publicly made the announcement. Eldon was finishing his education in business at Woodbury Business College and wanted to be settled in some kind of work or business before we made an announcement or set a date for our wedding. After his graduation he set up an accounting business in Upland. His accounts were local citrus ranchers and other small businesses. He also did income tax work for individuals along with the income tax work of his clients. His monthly earnings were about $85.00. This would continue through the first couple of years of our marriage. After Eldon’s proposal my goal was to prepare as well as I could for our life together. I earned some money cooking evening din­ners in the home of a banker named Harlow Wilson. I would go about 4:00 in the afternoon to cook and serve dinner and clean up the kitchen. Occasionally Mrs. Wilson would have me come at noon to cook and serve a luncheon to her guests. I was treated with respect and understanding in their home. After our marriage, I occasionally went back to help with special meals. Eldon gave me the cedar chest he had made during his junior high days. I used it to store my collection of items—clothing and household—to keep for our home. I redeemed Betty Crocker coupons to get a set of flatwear, and I embroidered feedsack dish towels, made pillow cases, and began knitting a dress to wear on our honeymoon. We eventually set the date for our wedding for Dec­ember 3, 1939. Gladys and Evan were both married in May 1939, so final preparations for yet another wed­ding in the same year must have been hard for my parents. Someone made the remark, “Walter Bohen is surely cleaning house fast!” Mother and Elizabeth (she had been married in 1937) made my wedding dress. It was white satin fashioned in a simple sheath style. I didn’t have a veil, but was expected to wear a covering, as did all Brethren in Christ brides who belonged to the church. It was the custom among us that each couple would be given a home shower before the wedding. This generally was organized by some family member or close friend. And, if possible, it should be a surprise to the engaged couple. Individual invitations were not sent, but an announcement of the time and place was circulated discreetly to the church. Our shower was hosted at Eldon’s parents’ home following a dinner for members of the quartet Eldon had been a part of since high school. It was a complete surprise to us and the house was full to overflowing with friends and well-wishers. We appreciated a variety of useful gifts for us to begin housekeeping. The ladies of the Norco church also held a bridal shower for me. These showers brought the reality of marriage into focus and assured us that we had the goodwill of many friends and family. We were married at 4:00 p.m. on Sunday afternoon, December 3, 1939 in the Upland Brethren in Christ Church. The church was simply decorated with candelabra, greenery, and two large standing baskets of yellow and white pom-pom chrysanthemums. Arthur Climenhaga, a close friend since Upland College days, officiated the ceremony. [Beulah College was renamed Upland sometime in the late 1940s.] It was Arthur’s first time to officiate at a wedding and he and Eldon declared that he was more nervous than the groom. It was a typically beautiful California afternoon and the church was full with family and friends, all in all a lovely day. 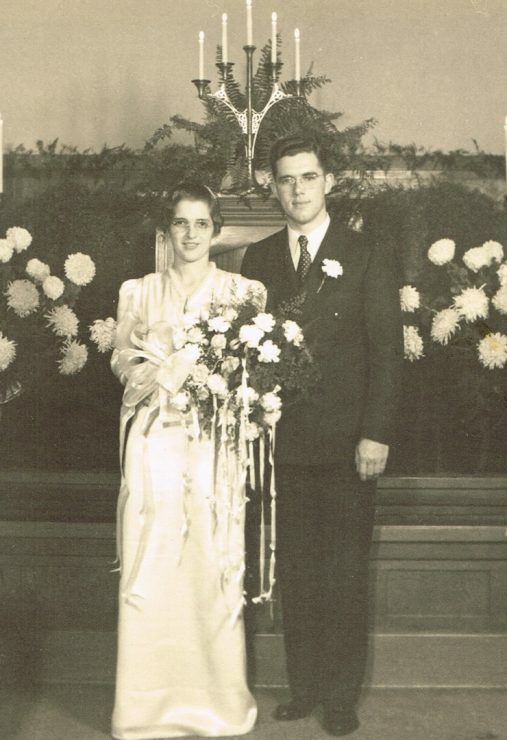 Harriet and Eldon Bert on their wedding day, December 3, 1939, Upland (CA) Brethren in Christ Church. The wedding reception was held in the church basement immediately following the ceremony. Eldon’s parents kindly helped with the expense and preparations for a larger reception. The previous day his mother baked chocolate cupcakes to add to the wedding cake. Guests enjoyed these desserts, the wedding cake, ice cream, and fruit punch. I think there were nearly 200 guests who attended the reception. As soon as we changed into our traveling clothes, we left for our short honeymoon. Our destination was Santa Barbara, about 100 miles north of Upland along the Pacific Coast. Eldon had bought Grandpa Franklin’s Plymouth coupe when he began his accounting business. We drove to a motel in the Santa Monica area and enjoyed four days, including a good tour of the Santa Barbara Mission. I was very eager to get back to Upland to set up our home and begin life as Mr. and Mrs. Eldon Bert. Our first home was a small furnished house in back of Eldon’s family home on 3rd Avenue. Daddy Bert rented us that house for $10 or $15 a month. I know we had the usual adjustments to being a married couple. Housekeeping was no problem, and I loved everything about keeping my own house and cooking our meals. My biggest challenge was learning how to share Eldon with his parents. He was always very close to them and living on the same lot gave him the opportunity to drop in often to visit with them. It was hard for me as a new wife to have him come home from his work and say, “I think I’ll go see the folks.” I loved Daddy and Mother Bert, but it was hard for me to accept Eldon’s twice-a-day visits to them—without me. Gradually, Eldon’s visits became less frequent and I accepted them when they did occur. We enjoyed our little home while living very frugally. I learned to cook good meals by making many meat-stretching dishes. It seems al­most unbelievable, but I think I allowed 10-25 cents per person for a meat dish when I shopped. Consequently, we ate a lot of macaroni and cheese, canned pink salmon, and hamburger. We didn’t eat out, except when we were invited to someone’s home. On Eldon’s $85.00 a month we were even able to save toward buying a bigger house. I worked occasionally getting dinners or lunches for the Wilsons and one month I clerked at a five-and-ten-cent store owned by one of Eldon’s clients. I enjoy­ed that kind of work and the wages allowed me to buy a small sewing machine. That sewing machine was put to good use as I made many of my own dresses, Eldon’s pajamas, and eventually, most of the clothes for our sons. Eldon continued his accounting business, often working at home in the evenings, especially during tax season. His business grew and so did his income. He was appointed city clerk of Upland and this brought a small monthly check too. In a little more than a year we moved into another unfurnished house that Daddy Bert had bought. We went to a Bekins Storage House in Los Angeles to do our shopping. Bekins was a moving company that also stored furni­ture for people who were moving. Many times this furniture was unclaimed and then put on sale by the company. We found a house full of second-hand furniture at a reasonable rate. We paid in cash, a practice we kept throughout our life. We didn’t buy something unless there was cash on hand to pay for it. Credit cards came into vogue later, but even then we used them more as a convenience, never if there wasn’t money be­hind them. The house had three bedrooms. One was used as an office for Eldon and we hoped the third small bedroom would become a nursery. Eldon and I were happy and looking forward to the birth of our first child. I didn’t have much knowledge of what to expect in pregnancy, so took as a matter of course the difficult days. Norman Allen was born on June 6, 1942 after a day and a half of extremely hard labor. I stayed in the hospital with him for at least 10 days and remained in bed at home for another week. We hired a lady from the church to care for both me and Norman. Of course, strength returned and our family settled down to enjoying our home and our place in the community and church. Our marriage came during somewhat troubled times. America had quite well recovered from the depression of the early 1930s, but then came the threat of war. Norman was nine months old when Dwight (Eldon’s brother) was inducted into the army. My brother, Evan, followed soon after. Eldon was deferred because he was a father and later got deferment through the efforts of his employer, Mogle Brothers Pump Company in Chino. We assumed that Eldon wouldn’t ever be called but there was unease in the entire popula­tion. When Japan bombed Pearl Harbor, the West Coast took great precautions against the threat of invasion by the Japanese. There were nightly black-outs when every window had to be darkened. Observers were stationed at high points in the area to keep watch around the clock for any aircraft approaching. Daddy and Mother Bert took their turns at this and sometimes Eldon would accompany them. There was rigid rationing of many things: sugar, butter, meat, gasoline, even shoes. Every member of the family was issued coupons to buy these rationed items. It was not an easy time, but we managed to carry on as well as anyone. As the war in the Pacific continued, every effort to keep Eldon out of the army failed and he eventually got his papers to report to the draft board. This created a pro­blem for Norman and me. As it turns out, Daddy and Mother Bert had begun to remodel their 3rd Avenue house. The remodeling provided an answer as to where Norman and I would live while Eldon was in the army. As did his brother Dwight and my brother Evan, he entered the army as a conscientious objector which meant that he would serve but would not carry a weapon (non-combatant). For the first several weeks his post was at Fort MacArthur in San Pedro, a couple of hours drive from Upland. Eldon had an office job so he could often come home for a day or so each week. About six weeks after his induction Japan surrendered, bringing the war to an end. Eventually Eldon was transferred to Fort Lewis in the state of Washington. He wrote the checks and worked at the task of mustering-out the troops as they returned home. When Eldon went to Fort Lewis, Norman and I moved into the Berts’ newly finished upstairs rooms. In a short time Eldon learned of an officer who was willing to give Norman and me a room in his home on the base in exchange for work helping his wife and small daughter. This arrange­ment worked well, for Eldon often could come to us for the night. We thought we were quite fortunate and settled. But in a very short time Eldon received orders that he was to be moved to Camp Beale, California. The day before our sixth anniversary we packed up and drove to Camp Beale. We decided to rent a room there, if possible. When we arrived, we spent the entire day hunting a room but they were all filled. Eldon had to report to the army base at the end of that day. We were so tired and discouraged that I opted to deliver Eldon to his post and then drive home to Upland. Perhaps it was a foolish thing to do. We made a bed for Norman in the small space behind the seat of our coupe, and I began the drive of 500 miles from Camp Beale to Upland. Night was coming on and I had a long drive ahead of me. We had already driven a long day from Washington state and then spent another day in fruitless searching for a room. I don’t know if I stopped early to eat something, but I know it was brief. Norman slept most of the way. I had no radio or anything to help me keep awake and a dense fog moved in the San Joaquin Valley. At one point I almost ran into the abutment dividing the highway. I knew I had to have sleep but I couldn’t bring myself to enter a strange place for the night. Sleeping on the side of the road was not safe, so in des­peration I drove in to a motel and asked if I could sleep in my car for a little while. I’m sure the proprietor of the motel didn’t know what to make of this distraught woman with a small child who didn’t want to get a room. But I was given permission to sleep in the car in the parking space. After an hour or so I drove on and arrived at Daddy’s home around 6:00 a.m. I’m sure God sent a guardian angel to be with me that night. Mother and Daddy Bert did everything they could to make us comfortable and happy. As Christmas approached, Eldon wrote that he hoped to be able to come home for the holiday. We missed him dreadfully and prayed that the visit would happen. Our prayers were answered; early Christmas morning we saw him walk­ing up 3rd Avenue toward home. What a reunion! He had hitchhiked from Camp Beale, as was common in those days. Soldiers were almost always given rides and he was able to ride with a family that was coming to the area. We had a wonderful time during his short furlough. Soon after the New Year he had to report back to the camp. We decided that he would take our car. After his return he spent every available time away from his duties hunting for living quarters for us. At last he found a two-room building in a very poor section of Marysville, a small town not far from Camp Beale. It was in terrible condition, but was the only possible place. It would need a lot of heavy cleaning, but once that was done we could be together. Aunt Mae [Eldon’s mother’s sister] and Uncle Guy Shore were planning to leave for their home in Oregon and offered to take Norman and me and enough basic household things to Marysville. They must have pulled a trailer, for we took quite a few things. When we arrived at the house, we were shocked at its condition. Evidently chickens had the run of the house. The only plumbing was one cold water faucet at a makeshift sink in one of the rooms. Aunt Mae and Uncle Guy and I set to work at cleaning to make it habitable. The first thing Eldon did was dig a hole not far from the house and cover it to be used as an outhouse. We bought a couch hide-a-bed and a few other necessities. I used a two-burner hot-plate for a stove and a primitive oven set on one of the burners for an oven. In one corner of what we would call our living/bedroom, Eldon built a frame for Norman’s bed. I brought my sewing machine and made curtains and a curtained-off ward­robe. We had brought a table and chairs for the other room we called the kitchen-utility-bathroom. From this awful shack we created a home. It was not easy, but we were together and Eldon could come home every night. On Sundays we attended a Disciples of Christ Church in Yuba City where we felt accepted and supported. An older couple befriended us and became our greatest support until Eldon was released from the army. Often we would be with them for dinner on Sunday noon. We had many happy times together. We eventually moved to a better house nearby, but in a very short time Eldon heard of a house in Grass Valley near the mountains. We went to look at it and I still remember my delight at seeing a proper bathroom with a bathtub. We rented it even though it was farther from the base. It was a lovely home for the rest of Eldon’s army days. In the summer of 1946, Eldon was discharged from the army and we returned to Upland. Norman was four years old, and I was again pregnant. We had no home of our own to return to since Daddy Bert had rented the 6th Avenue house to other tenants. So we moved into the Bert home occupying the up­stairs room for sleeping, but becoming a part of Daddy’s family in all other ways. During the last couple months of army life, Eldon had been working on plans for a house. Land was available to us in the orange grove owned by the family, on Arrow Highway very near to the Beulah College campus. Eldon had the blueprints made for a two-story house to be built in phases. We took advantage of the government GI bill which helped us when it came time for payments. The first phase of the house was to build the garage and service porch. At one end Eldon planned for a bedroom that would eventually become his woodshop. Adjacent to that was the two-car garage which was to be the living room and dining room of this garage home. At the other side of this was our kitchen and bathroom which would become the service area of the house when we could build it. We had room in this kitchen area for a small table so that the family needn’t use the larger dining room. This project was a major undertaking and Eldon spent every day, except Sundays, on construction. The area had municipal water, but no sewage system, so Eldon had to dig the cesspool which served us well until many years later a when a municipal sewage system was brought to the area. By the end of 1946, he had built a comfortable home for us. Daddy Bert had helped as much as he was able. We really wanted another child but my doctor had told me after Norman was born that it would be dangerous for me to get pregnant again. I had had a hard time at Norman’s birth, but by the time we left the Army, the doctor had told me it was okay to try again and I was pregnant. It wasn’t an easy pregnancy, and one time I was threatened with miscarriage. On January 31, 1947, Arthur Paige Bert made his debut into our lives, weighing almost seven pounds. I stayed in the hospital about 10 days as was usual for a birth in those days. When I came home from the hospital we hired a young unmarried lady, Angela Kauffman, to come in each day to help me with the housework and care of the children. She washed countless diapers (we knew nothing about Pampers in those days) and did the heavy work of housekeeping. Arthur was a happy baby, but he decided that the nights were too long and he’d waken in the early morning hours. Our bedroom quarters were so small and disturbance was easy, so we finally bought a baby carriage where we put him when he wakened and then rolled him out to the other room where he would make his baby noises and play until I got up to give him a bottle. The situation was not easy. 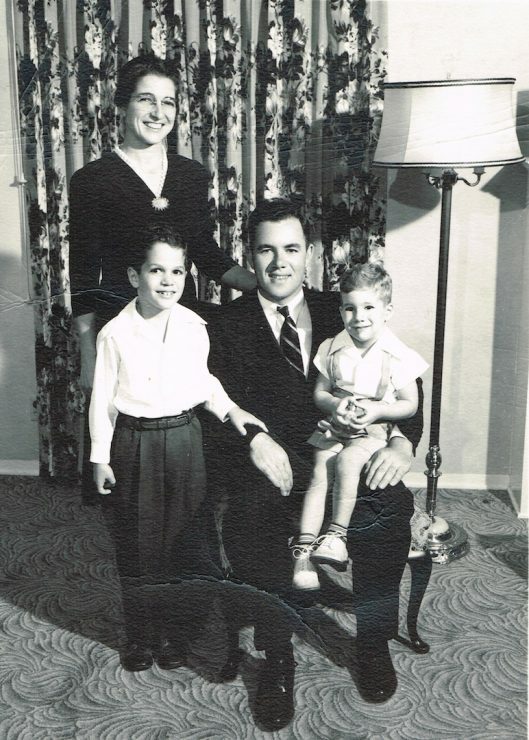 In those first months, my parents, who had moved to Pennsylvania, came for a visit and to attend the Brethren in Christ Church General Conference. It was a big time for reconnecting with friends from other districts and churches. They came for General Conference with the added benefit of seeing their new grandson and visiting their other children in the Upland area. One afternoon in January 1948 I had put the boys to bed and I sat mending or knitting in the living room. Daddy and Mother Bert had left the previous Sunday for Kansas to attend the funeral for great-aunt Sarah Bert (who had served for many years at the Chicago Mission). Daddy had a big, heavy Packard and he and mother with Uncle Jake Bert, Aunt Fannie Bert, and Aunt Sarah Hoover were looking forward to a good trip together. As I sat and thought about them and their travelling, for some reason I thought, “What if some accident would happen and Daddy would be taken?” The telephone rang. Vera (Mrs. Alvin) Burkholder was on the line and told me to come to their home immediately. I don’t remember how I managed to leave the boys or if someone came to stay with them but I knew something dreadful had happened. I think Vera told me there was an accident and when I asked, “Is it Daddy?” she said, “No, it’s Ada (Eldon’s mother).” The awful news couldn’t have been worse. There had been a horrible accident (not Daddy’s fault), and Mother was gone. They were travelling on the famous Highway 66 when they hit a freak pocket of dust blowing across the road from an adjacent plowed field. Sensing possible danger, Daddy stopped the car in the midst of the dust and urged everyone to leave the car in case they were rear-ended. Mother was in the midst of getting out of the car when they were hit from behind. When Daddy looked for everyone after the impact, he couldn’t find Mother. The coroner told us later that she had been killed instantly. That was a consolation, though it didn’t really lessen the loss. Dealing with such a loss and tragedy was new to all of us. Arthur was just three days from his first birthday. Faye and Dwight moved in with Daddy, and our church family and friends did what they could to help. We needed to keep busy, but grief was always with us. The one who had been the mainstay in the family was no more. How we all missed her! I had lost not only a wonderful mother-in-law, but my best confidant and friend. I had felt almost closer to her than I did to my own mother. Her funeral was one of the biggest the church had ever known. Mother had been active in the local Red Cross and many other community activities. She was a wonderful Sunday school teacher. I know of one class member who said he accepted God as a result of her death. Our insurance adjuster claimed to have accepted Jesus because of his contact with Daddy and the family and the faith we all professed. Even Norman fondly remembered his grandma feeding him ice cream during his convalescence from a tonsillectomy. He and his Grandma Bert were great pals. Before Norman’s kindergarten year ended, he was diagnosed with rheumatic fever. He had a low grade fever all the time and so the doctor ordered complete bed rest. Eldon carried him to the bathroom and gave him his baths. I had to take his temperature three times a day. I still recall how discouraging it was when there was no change. As long as he had fever he was not allowed to get out of bed. Playmates were not allowed to visit, because his temperature would go up. He was mostly alone with only his little brother and parents. Arthur was a little over a year old and learning to walk. He was a happy child, but much more active than Norman had been at that age. During these months we didn’t go out much. Someone always had to stay home with Norman. When Eldon was home on Saturday I hurried to the market for groceries while he looked after the boys at home. We settled into a routine with Norman’s care a major priority. Finally, after about six months, he was permitted limited out-of-bed activity. When school began again, the doctor advised that Norman should be taught at home. We had a visiting teacher who came in to monitor his first grade lessons once a week, but I had to be his teacher the other days. Despite my lack of training, I helped with simple lessons while still managing the household and caring for an active Arthur. Norman was eager to learn and did his lessons well. After Christmas he returned to school. We were so thankful that he went with a clean bill of health with no damage to his heart from that long bout of rheumatic fever. Perhaps the weeks when we insisted on quietness and bed rest paid off, buut I know that the Lord surely helped us through that time. Eldon and Harriet Bert and their two sons, Norman (left) and Arthur (right). We enjoyed our garage home, but eagerly looked forward to building the rest of the house. The boys were growing and needing their own room and we needed our space too. When Arthur was about three years old we began our two-story home. Eldon drew up the plans and blue prints and hired a builder, Noah Guengerich. Mr. Guengerich was very patient with the “help” that Arthur offered. Arthur loved Noah’s tools and sometimes wandered away with one that Mr. Guengerich needed. We opted to finish the downstairs completely, but leave the inside of the upstairs to be finished later. Finishing the whole house would have severely strained the budget and we could get along quite nicely for a time with just the lower floor. After cramped quarters in the garage home, it seemed spacious. Television sets were becoming popular and we eventually bought a black and white set. That, along with the swimming pool we had installed in the backyard, was used by Upland College friends. We felt we wanted to keep up with the times and yet we wanted to be in control of what the boys watched and how much time they spent in front of it. Even though the church didn’t actually prohibit it in our homes they didn’t encourage it either. We still didn’t go to movies but TV seemed easier for us to control. I remember when Queen Elizabeth of England was crowned we invited some Canadian students to come over and watch the ceremonies. I enjoyed my role as homemaker. From the time I was a teenager I had felt that this was to be my role or “calling.” Some had callings to spiritual endeavors, but I felt that being a homemaker was my life’s work. And I was happy in it. Each day had its own schedule of chores. On Mondays I’d do the family wash. I had a washer but no dryer. California had lots of sunny days and I hung my clothes out to dry. Tuesday was ironing day. For a while I had a mangle iron where I’d iron the sheets and even the boys’ shirts. But I got rid of that eventually and ironed everything by hand. Friday was cleaning day. I had a routine for that too. The other days were full of different duties. On Saturdays I shopped for groceries for the next week. In the early days of our marriage there was no supermarket, so I did my shopping at a local private grocery store. I learned from the produce man how to choose my vegetables and fruit. There were seasonal jobs too, some of which I didn’t particularly like. Spring cleaning was especially loathsome, but as everyone else did it, I thought I should too. I’d take each room at a time and give it a thorough cleaning from the ceiling to the floor. I always breathed a sigh of relief when that was done. Summers meant canning fruits and vegetables. From the time I was a teenager at home and helped my mother in her canning tasks I have hated that job. We could get fruit right from the orchards. We’d go pick cherries, generally in the company of other families, and gather apricots from the orchards north of Upland. Those apricots were my favorite and they were delicious. Then there were peaches, cling and freestone. Those had to be peeled. Most of my canning was done open-kettle as opposed to hot-water bath where I’d fill the jars with fruit, pour over them the sugar syrup and immerse them in hot water to boil for a period of time. I hated the whole process, but the finished product tasted mighty good in the winter months when there was not so much fresh fruit to be had. I also froze corn. At that task my sister Elizabeth almost always helped me. She didn’t do any corn freezing herself but enjoyed helping me. We’d make a family day when she’d come to our house with her two children who would have a great day playing with our boys. I doubt if I’d have done so much if she hadn’t enjoyed helping me. Often at the end of the day we’d have dinner together and sometimes we’d make a freezer of ice cream. One or two times we had a picnic and went swimming at a public swimming pool. As I think back over those times, I wonder how we had all that energy. But they were fun times that cemented family ties. Another aspect of family life that was important to us was family worship after breakfast every day. We had both grown up with this practice and began it after we were married. I have often wished that we had geared it more to young children, but we had no particular instructions at that time as to how to make this time more meaningful to a growing family. Eldon and I continued this practice for the rest of our lives. We always thought it was a very important way to begin the day. In 1950, when Norman was about seven and Arthur about three, we decided to take an extended trip. We borrowed Daddy’s big Packard and built up the back seat so that it formed a good play area and bed for the boys. I had not been back to Kansas since we moved away when I was six. I didn’t remember a lot from those early years, but when we got to Moonlight, the small village where I was born, a strange feeling came over me and I remembered a lot of minor things that had happened there. We had a wonderful time visiting relatives on their farm. Then we went on to Pennsylvania to visit my parents, where they had moved in 1945 to be near my mother’s sister, Mary Long. At the time they were living in an apartment adjoining Aunt Mary’s home. In December 1950 not long after we had visited my parents, my father died suddenly at just 63 years of age. There was not as much known as to how to treat victims of heart trouble then as now. None of the family in California went to the funeral, but we all gathered at our home on the day of the funeral to remember him and his deep faith in God which he passed on to his children. A couple of years later, in 1953, we planned another trip, to see Mother and to extend our range of travel. Norman was 11 and Arthur was seven, so they were old enough for the trip to give them lasting memories. We planned to see the eastern United States and then go on to Nova Scotia in Canada. Eldon took a six-week leave of absence from his full-time job at the Mogul Brothers in Chino. Mr. Mogul was most generous to give him the time off and even offered us his gas card for fuel. That helped immeasurably for such a long trip. Eldon planned a trip budget, allowing $20.00 a day for food and lodging which totaled about $1,000. After we left Mother in Pennsylvania we went on to New York, Boston, and other points in the east before crossing into Canada. We visited Montreal, the Bay of Fundy with its 40-foot tide change, and other places. We found that most restaurants served a very good and substantial breakfast for a cost within our budget so that became our practice. The rest of the day we ate simple, budget-friendly meals. And we hunted for the cheapest and cleanest motels. Of course, when we were in the states, we stayed with relatives as much as possible. In Quebec we had trouble navigating the language barrier from French to English. Ordering food from French menus was a challenge but we made our way, enjoying the feeling of being in a foreign land, although we were glad when we got into more English-speaking provinces! In some cities we’d take a tour of the city, sometimes by horse-drawn carriage. Exposing our boys to the wonder of travel also helped them expand their taste buds. I insisted that the boys taste all kinds of foods before forming opinions. Back home, we began to be more involved in our church. Eldon had taught Sunday school classes before we were married and had been on denominational boards and committees, but I had never been actively involved except in choir or singing duets with Eldon. We eventually were placed in the young people’s department where we served for many years. We were in charge of the youth programs and often planned social activities for them. We had a good growing youth group and we enjoyed our work. Sundays turned out to be one of the busiest days of the week. We would often plan beach parties or other kinds of outings. Sunday nights were always the time for youth meetings, mostly at the church or in some home. Norman had joined a Bible quiz team, which involved in-depth study of a portion of scripture and competition with teams from other Brethren in Christ churches. One summer he travelled with the team to compete at General Conference in Canada. After that year, I felt I should get involved in that program, so I became a quiz coach. When I began that job, I knew very little about the events in the Bible. I had memorized a lot of scripture when I was small, but had not been very interested in in-depth study. I learned fast and was the quiz coach for four years. I enjoyed it and I learned as much as my quizzers. One year our Upland Team travelled to Pennsylvania and another year to Ohio to compete at the General Conference. As was the custom for quizzers at the time, we dressed alike as much as possible—skirts for the girls, and matching shirts for the boys. The year that we went to Pennsylvania (by car, not by air) we were studying the book of Romans. We were undefeated for the whole year and won the denominational championship at General Conference too. Arthur was a part of the quiz team for most of the years I was coach. I enjoyed coaching, and I even taught the Sunday school class for a time. We had a good youth group and a couple of good singing groups which I coached as well. I also joined several organizations that were more or less related to the church. I was part of the monthly sewing circle where a group of women would get together for the day to sew for needy causes. We also had a couple clubs for women within the church for purely social activities, such as the “Friendship Circle” of which I was a charter member. We drew names and those ladies became our “secret sisters.” I was a member of that until we moved to Pennsylvania some years later. Once a year the entire church would hold a Sunday school picnic. Families each brought a basket lunch to share with others—sort of a potluck picnic. The picnic was usually held at one of the many public parks. Sometimes it would be a park that had a swimming pool and many of the young people would go swimming. Co-ed swimming was not frowned upon at Upland like it was in other places. Often some of the families would stay on into the evening, eating the leftovers from lunch. Fun times indeed! Being a homemaker offered a mix of activities. Maybe that’s why I enjoyed it. I was somewhat of a perfectionist and wanted everything right. I hope I left a good mark as I kept house and interacted in the church and community. Eldon and Harriet with movie camera equipment. Photo courtesy of Brethren in Christ Historical Library and Archives. The rest of Harriet’s story details more travel, including trips to Brethren in Christ mission points in the U.S. and other countries. 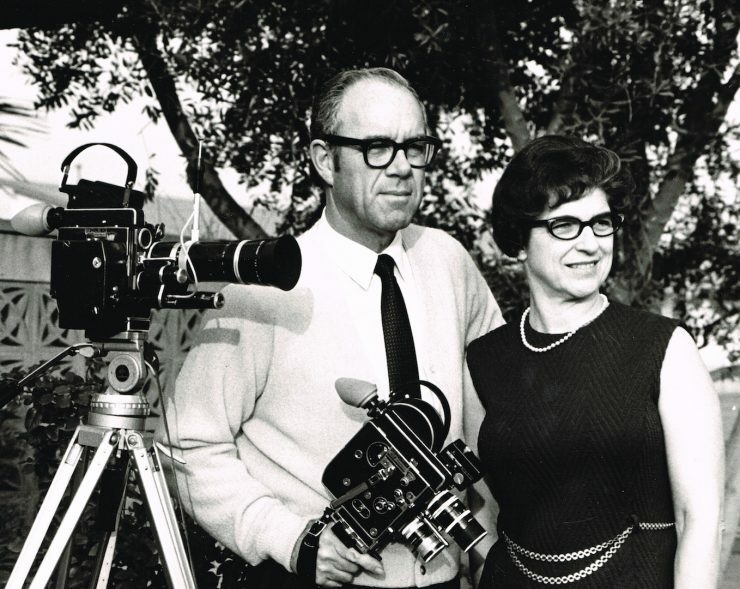 Having always taken photographs when they travelled, Eldon and Harriet decided to branch out into filmmaking and produced several missions-related films. In 1975, Harriet and Eldon moved to Pennsylvania to be nearer to their two sons and their families, and in 1982 they moved to a cottage at Messiah Village. They were active in the Grantham Brethren in Christ Church until their health prevented them from attending. Eldon passed away in 2004, and Harriet in 2015. They are survived by their two sons, Norman and Arthur, four grandchildren, and six great-grandchildren. 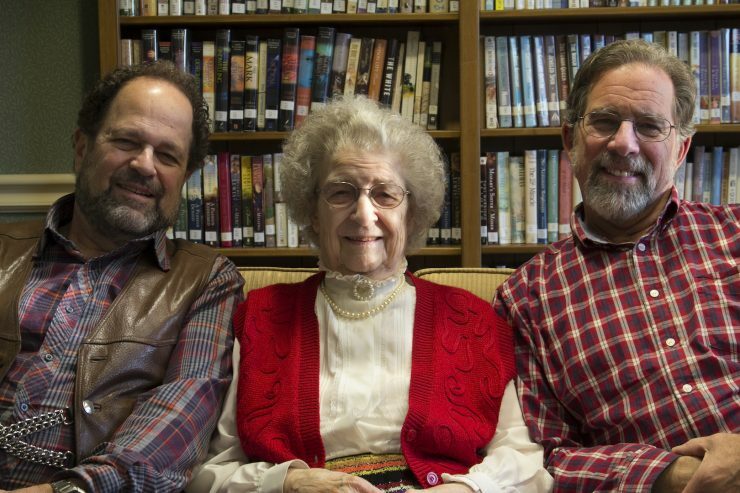 Harriet with her two sons, Norman and Arthur, circa 2008. Harriet Bohen Bert lived at Messiah Lifeways at Messiah Village, Mechanicsburg (PA) for 33 years. She was a member of the Grantham Brethren in Christ Church. She died in December 2015, at the age of 98, having been pre-deceased by her husband Eldon, and all her siblings. Read more articles by Harriet Bohen Bert.